Product information "DD PoLiCoax 500 extension set (2x Socket) - PowerLine Coax DVB-C"
With the Powerline flush-mounted wall socket Poli Coax 500, you can expand your existing DVB-C cabling for network distribution. By many conditions, it is often not possible or difficult to install network cables. WiFi connections often require the use of repeaters across floors to enable stable operation with sufficient data rates, but even then the bandwidth is often not fully usable by all WLAN adapters. The UP socket is a DVB-C through-socket with integrated GBit LAN interface. DSL / Ethernet data can be used via the GBit Ethernet connection. The coaxial jack provides a broadband cable signal (108 to 860 MHz) and can be used with a standard receiver. Your existing DVB-C socket will be replaced* by the PoLi Coax socket in your DVB-C cabling. All sockets must be connected via the coaxial cable. For example, the network signal can be fed from a router or a streaming server to the first socket, this allows the distribution to the other sockets. The connected network devices can communicate with each other, so the distribution of Internet and data exchange is possible at any time. The decoupling of the TV signal is done via the coaxial plug, the network data via the RJ45 plug. A networking of the individual sockets takes place automatically. The first socket power up to 5 more sockets linearly, this requires a 24V / 1A power supply. If more than 5 sockets are used, another power supply must be placed from the fifth or sixth socket for further sockets (depending on the cable length). The Digital Devices PowerLine sockets are perfect for small corporate networks, home users and streaming solutions in hotels or homes. 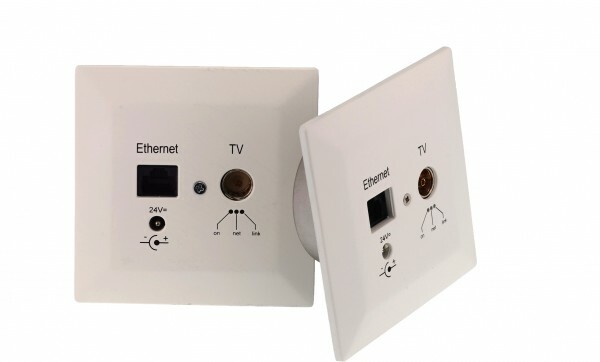 *Unless all sockets of the DVB-C cabling should be replaced, make sure that the used DVB-C standard socket have a compatibility with the supplied 24 volt voltage and that the signal connectors have sufficient DC blockers. Related links to "DD PoLiCoax 500 extension set (2x Socket) - PowerLine Coax DVB-C"